The best place to retire. N.C. is one of the country’s top retirement destinations. North Carolina is known for its vast geographical landscapes — more than 300 miles of coastal beaches, vibrant Piedmont cities and the eastern U.S.’s tallest mountains. With warm summers, mild winters, bustling college towns, tourist attractions, shopping, recreational opportunities, cultural events and more, North Carolina has the proud distinction of being one of the country’s top retirement destinations. The Triangle area of North Carolina — including Raleigh, Durham, Chapel Hill and Cary — offers something for everyone and is a great place to retire. 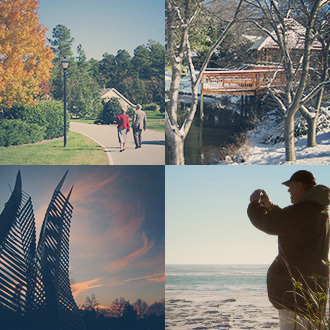 Whether you’re interested in the arts, education, sports, entertainment or family life, central North Carolina has it. Centrally located between North Carolina’s scenic Blue Ridge Mountains and serene beaches, the Research Triangle area has become a desired destination for seniors across the nation. Within an hour’s drive are numerous attractions, such as The North Carolina Zoo in Asheboro, Seagrove Pottery and Pinehurst Resort and Country Club. Boating or a day at the beach are just a short three miles away at Jordan Lake. For your convenience, fee-for-service scheduled transportation is provided to all parts of the RDU Triangle.